If it wasn't grotty, it was too expensive, or often both. "Our experience was horrible," says 28-year-old Englishman Ben. "As an international student from Argentina, Mariano had to pay 12 months' rent up-front to get his place in London. "Meanwhile, Miguel [who is from Portugal] booked some random super-expensive residence in Nottingham because he didn't know any better, and I was looking around the streets of Nottingham knocking on doors trying to find a place." While it was irksome at the time, a year after graduating from their respective universities - Miguel and Ben from Nottingham University, and Mariano from King's College in London - the three men realised that there was a business opportunity. Ben says: "It was clear that people were doing more online and that marketplaces such as Airbnb were a great solution for travel, but finding accommodation was such a problem for students around the world." So in 2011 the three started work on their business and website Uniplaces. The trio invested around £50,000 - a sum whipped up from their savings, student loans and help from parents. To save on costs, the men stayed at Miguel's parents' holiday home in Ponte de Lima in northern Portugal, before participating in start-up competitions to win free office space, first in Porto, the country's second city, and then in the capital Lisbon. Later that year they won first round funding of 200,000 euros ($215,000; £172,534) led by the founder of UK property website Zoopla. Mariano, 28, says: "We picked Lisbon as our first city as it totally made sense to stay [and open headquarters here]. "It is a low cost, good location with access to great talent such as good engineers, and people with excellent language skills, which is great when dealing with so many international students. "For the first hundred plus properties we actually went round them ourselves with our cameras taking pictures, cleaning the places up and asking people to get out of the room." Students using Uniplaces pay one month's rent upfront via the website, and the sum goes through to the landlord 24 hours after they move in. Thereafter they pay directly to the landlord. Uniplaces takes a service fee of 20-25% of the student's first month's rent, and then a commission of 5-12% of the total value of the contract from the landlord. Revenues grew four-fold in 2016 compared to the previous year, but with the money being reinvested into the business Uniplaces is yet to turn a profit. The company, which now has 132 employees, has also continued to attract the attention of investors. Last year it received $24m (£19m) in its fourth round of funding. But it hasn't been all plain-sailing for the three entrepreneurs. Initially they were too ambitious and tried to expand too quickly. 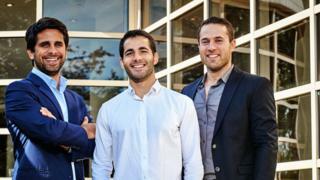 Miguel, 27, says: "We wanted to be a global start-up so we quickly launched in 70 cities. But then you start compromising." Miguel adds: "Investors want results, but then you realise you need to focus and deliver a good experience for the customer and make sure landlords' properties are getting filled up. "That helps grow a more successful company. It's a balance of ambition. We want to get out to the world but we have to stage it. So in 2016 we went down to six cities and focused on them." Today the business has expanded back up to 15 cities - London, Manchester, Nottingham, Lisbon, Coimbra, Porto, Madrid, Barcelona, Valencia, Rome, Bologna, Milan, Paris, Berlin and Munich. "Dedicated companies have popped up offering purpose-built student flats across the UK and other accommodation services. "Alongside the standard mix of landlords it can be hard for students to know who to turn to and trust. Uniplaces is fairly innovative because its interest lies more with the student, supporting first-time renters to find good deals." The ambitious trio also have visions of creating a more wide-ranging university brand. There'll also be the launch of an app where Uniplaces brand ambassadors will be on hand to answer any questions students might have about their new city. Ben says that the aim of such initiatives is to make renting student accommodation through Uniplaces as "welcoming" as possible.